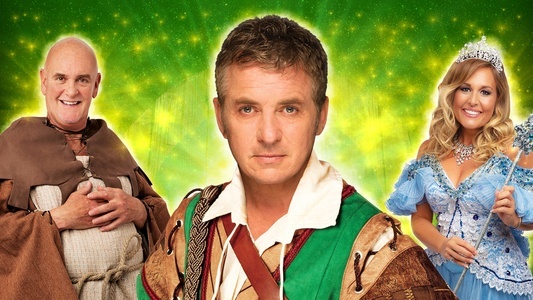 When Shane Richie slips into the green tights and sharpens up his arrows this Christmas, he will be joining a long and noble line of actors who have portrayed the outlaw with a heart of gold. Robin Hood may (or may not, nobody really knows) have roamed Sherwood Forest robbing the rich to give to the poor hundreds of years ago but the appeal of the legend remains as strong as it ever did as this list of actors who have played the part reveals. Robin Hood, 1912: the first outing on the big, if silent, screen came in 1912 with Robert Frazer as the eponymous hero. Robin Hood, 1922: the first motion picture ever to have a Hollywood premiere. Starring Douglas Fairbanks, it was one of the most expensive films of the 1920s, costing approximately one million dollars. The Adventures of Robin Hood, 1938: a real swashbuckler, filmed in Technicolor and starring Errol Flynn. The Bandit of Sherwood Forest, 1946: a new angle on an old theme; this one is about the son of Robin Hood and starred Russell Hicks (no, I don't know who he is either). The Prince of Thieves, 1948: inspired by Alexandre Dumas' 1872 novel Le Prince des voleurs and starring Jon Hall, this one predates the Kevin Costner version by more than 40 years. The film was shot in the Cinecolor process' great, except for the fact that the process can't reproduce the colour green. Rogues of Sherwood Forest, 1950: another 'son of' outing. John Derek plays Robin, the Earl of Huntingdon, the son of Robin Hood. Alan Hale, Sr. played the part of Little John for the third time in 28 years, having previously appeared in the part opposite Douglas Fairbanks in 1922 and Errol Flynn in 1938. The Story of Robin Hood and his Merrie Men, 1952: Live action Disney version of the legend starring Richard Todd and filmed right here, in Buckinghamshire! Robin Hood, 1953: TV finally caught up with the goings on in Sherwood Forest when the BBC transmitted one season of the show live - and then got the cast to re-enact them the following Saturday or Sunday in order for a repeat to be shown! The second Dr. Who, Patrick Troughton, played Robin Hood. The Men of Sherwood Forest, 1954: British adventure film following the exploits of Robin Hood, starring Don Taylor. The Adventures of Robin Hood, 1955-1959: 'Rahbin Hood, Rahbin Hood, riding through the glen!' Aren't glens in Scotland? Never mind, these 143 half-hour, black and white episodes broadcast between 1955 and 1959 on ITV made a star of Richard Greene (how perfect is that name?) and enthralled children every week for years. Robin Hood, e i pirati, 1960: little is known about this Italian film, other than it starred Lex Barker as Robin Hood. Robin and the 7 Hoods, 1964: American musical film re-imagined as a 1930's Chicago gangster setting starring members of the Rat Pack and Bing Crosby. Produced by Frank Sinatra and starring Ol' Blue Eyes himself as Robbo, the film introduced the hit song 'My Kind of Town'. A Challenge for Robin Hood, 1967: British adventure film starring Barrie Ingham. L'Arciere di Sherwood (Long live Robin Hood and The Scalawag Bunch), 1970: our home-grown hero is clearly popular in Italy as Giuliano Gemma stars as Robin Hood. Up the Chastity Belt, 1971: with Hugh Paddick as Robin this is a spin-off from the TV series Up Pompeii! which starred Frankie Howerd, who played dual roles as King Richard the Lionheart and the cowardly peasant, Lurkalot. The Legend of Robin Hood, 1975: starring Martin Potter as Robin, this BBC television serial broadcast in the Sunday teatime slot was horribly violent and included a scene where the disabled Ralph Gammon and adolescent Much are hanged by a lynch mob. Ooh-er! When Things Were Rotten, 1975: American TV sitcom created by Mel Brooks and aired for just half a season with Richard Gautier as Robin. Ivanhoe, 1982: David Robb popped up as Robin of Loxley in this television film adaptation of Sir Walter Scott's novel of the same name. The Zany Adventures of Robin Hood, 1984: parody film of the story of Robin Hood starring George Segal. Robin Hood: Prince of Thieves, 1991: the biggy. With Kevin Costner as Robin Hood with support from Morgan Freeman, Christian Slater, Mary Elizabeth Mastrantonio and Alan Rickman as the Sheriff of Nottingham - boo, hiss! This major box office hit made over $390 million worldwide and the film's theme song, '(Everything I Do) I Do It for You', by Bryan Adams, stayed at the top of the charts for 16 weeks. Robin Hood: Men in Tights, 1993: another Mel Brooks fun film starring Cary Elwes as Robin. Loads of enjoyable comedic references to previous Robin Hood films (particularly Robin Hood: Prince of Thieves, upon which the plot is loosely structured). Robin of Locksley, 1996: TV movie starring Devon Sawa as Robin. Beyond Sherwood Forest, 2009: entirely forgettable TV movie starring Robin Dunne. Robin Hood, 2010: British-American epic adventure film directed by Ridley Scott and starring Russell Crowe who famously got pretty 'annoyed' when his Robin Hood 'Midlands' accent, on which he had worked so hard, came in for some mirthful stick! Robin Hood, 2018: And after so many famous actors have stepped into the role. Kingsman's Taron Egerton picks up the bow and arrow with support from Jamie Foxx and Jamie Dornan. 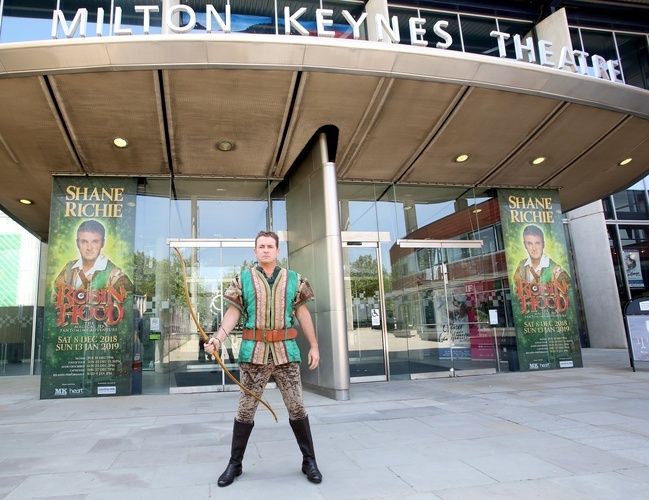 So Shane Richie, starring in the first ever Robin Hood to grace the stage at Milton Keynes, has a lot to live up to. But of anyone can do it, he can. After all, faint hearts never won fair audiences!